Comm Eye Health Vol. 30 No. 97 2017 pp 14. Published online 12 May 2017. MD, CBM Regional Eye Health Adviser, Addis Ababa, Ethiopia. International Coalition for Trachoma Control, UK. Assistant Director of Programs & Communications, International Trachoma Initiative Task Force for Global Health, Decatur, GA 30030 USA. An innovative global training approach called HEAD START is bridging the gap between theory and live surgery, building skills for new trainees as well as providing continuing professional development for experienced surgeons. Repeated infection with Chlamydia trachomatis leads to inturned eyelashes and painful trichiasis which has a profoundly negative impact on quality of life. It can be corrected by eyelid surgery but, if left untreated, can lead to irreversible low-vision and blindness. Twenty years ago, Demissie Tadesse was a young doctor who had completed his ophthalmic training in Italy but did not have the opportunity to practise his surgical skills for trichiasis. He remembers the early days of working back in his home country of Ethiopia. Looking back, he can see how a practical step between the theory he learnt in the classroom and his first surgery on a human eyelid would have eased the transition from theory to live surgery. A comprehensive training approach, HEAD START, aims to bridge this gap. The innovative method, which is a result of wide collaboration between many partners, includes a surgical mannequin on which surgeons can practise their surgical skills. It helps new trainee surgeons to build their skills and confidence before performing surgery on their first patients as well as providing useful refresher training and regular professional development for experienced surgeons. The comprehensive training approach covers all aspects of preferred practices on addressing trichiasis developed by the International Coalition for Trachoma Control (ICTC). 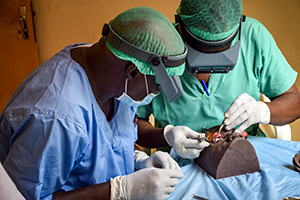 With the scale-up in programming to trachoma elimination by 2020, much attention has focused on increasing the quantity of surgeries performed and the training of surgeons. Since Demissie became involved with HEAD START three years ago, it has become a widely adopted training approach. All major funding initiatives supporting national trachoma programmes now use this ICTC recommended and WHO endorsed approach for newly-trained and experienced surgeons. To maintain high-quality training standards, all training is undertaken by certified national master trainers directly, rather than through the previously widely used (but now discouraged) cascade approach. The WHO now recommends mannequin-based training for trichiasis surgery as part of new and refresher trichiasis surgery training programmes. Going forward, a Seeing is Believing project in Ethiopia will support the maintenance of skills through remote monitoring of surgeons during the rainy seasons when fewer surgeries are performed. Over five months, the surgeons will undertake two surgeries a week on the mannequin and send the cartridges to a central office for review and monitoring. The innovative approach has also germinated thinking in other areas. USAID’s Morbidity Management and Disability Prevention (MMDP) Project, inspired by HEAD START, is developing a similar mannequin training approach for lymphatic filariasis hydrocele surgical training. The HEAD START approach is improving quality outcomes across the global trachoma elimination programme. Through its training of trainers and now also augmented by remote learning, it is truly providing a tool for continuing professional development and lifelong learning.